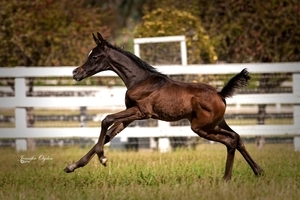 Another gift via embryo transfer, this mare is so very special. 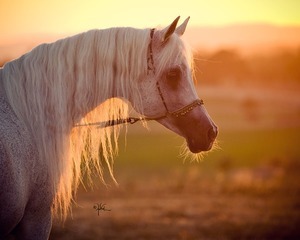 She is the only daughter of our beautiful Shaboura by *Simeon Shai+, our most famous stallion. We decided to let her go on to new owners when the perfect opportunity presented itself. 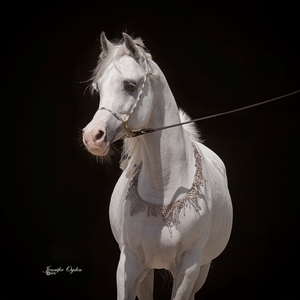 She went to Al Thumama Farm to become a foundation mare for new breeders in Qatar. Miss Dana Al Meslemani and her father, Nabil Ali Bin Ali started a breeding farm there with the idea of breeding Purebreds and straight Egyptian bloodlines. It is a long ways away, in the Gulf Nation of Qatar but fortunately we visit there frequesntly and it is alwasy a joy to see how well loved this amre is plus we stay in touch with Dana. She has turned out to be one of their favorites and is quite spoiled by the whole family. Her gentle nature is especially appreciated by the youngest family members. When Henry and I were in Qatar in 2011 we were able to see her show there and place third in a very competitive class of well known mares. We are so happy she is with this famliy and wish them all the best success in the future. We saw her again this year as well in 2014, she is still a lovely mare and well loved.